Back in college, I had a wise, older professor of Theology, Dr. Seat. He humored us with his blog, “The view from my seat.” I always thought that was such a cute and clever name! And, I have often thought about the view from my seat, and the view from the people around me. We all see things differently, cope in different ways, however, we are so much alike. I write this not only to talk about my view, but hopefully to give tips to other special needs families and make your view a bit brighter. Parents with special needs children usually have something that is a priority in their child’s life. For example, a behavioral plan, physical accommodations, or a nourishment regimen. Well, the view from my seat is typically out of my kitchen window, to my lovely screened porch and family friendly backyard (trampoline, swing set, dog poo). I spend hours in my kitchen every day, preparing food and feeding my son via a Gtube. So, there is the argument—Get a life! Don’t focus on it! Blah, Blah, Blah. But, lets be realistic here—this is big part of my life! Of course our lives are full, of all the typical family things. But, providing 100% nourishment for your child is a full time job. For parents who may not understand, it is similar to breastfeeding, in the aspect of being the sole provider of nourishment. But, there are many more steps involved, and for some of us, it is a lifetime commitment. There should be more education on feeding tubes. I literally watched a 30-minute cheesy video on “highlights” of tube feeding. It had a teen riding her bike, “look, I can ride my bike with a Gtube.” It had a parent setting up the pump, “it’s as easy as 1,2,3!” I had no clue what I was in for, I had no choice but to accept the challenge that was before me. Fast forward three years later, I have learned so much: I have researched, talked with parents, joined support groups, and found fabulous Face Book pages that have saved my sanity. There are days when it is a love/hate relationship. But, for the most part, I have graciously accepted and tried to be creative with the hand that I have been dealt. My dear son, Chase, has been diagnosed with a genetic syndrome (which impacts his eating). I won’t identify him by this, because he is so much more than a title of some long, hard to pronounce syndrome! But, the reality is, from birth eating was a challenge. To put it bluntly, oral eating didn’t exist. Life got brighter after I got rid of the doctors that thought I wasn’t feeding him purposely (sigh! ), I still think I should send them the genetic results! I became educated, very educated on tube feeding, feeding options and increasing oral skills. Chase, 8 months old, fed through NG. At two weeks old, he got a NG tube (a tube that goes from your nose to stomach), at nine months a Gtube (directly in stomach), and just a few weeks ago ate gold fish crackers for the first time in his life! Wooo hoo! It has been a long process. It is not a process that a parent is ever properly informed about. Most often the goal is “tube for life” and using a canned can’t-pronounce-the-ingredients formula. What is not discussed is the many options that are available for nourishment and most importantly, the psychology that comes with tube feeding a child. I do not and will not judge any family and their journey, each family has made the best choice for their child. I would, however, like to be frank regarding the psychogical impact of providing complete nourishment for a child and to encourage, empower and provide hope for a mental shift that must take place. So, back to the kitchen. I have chosen to ban the can and make Chase’s food—aka “Blended Diet”. (Feel free to check out my blog, “Just One Bite,” which talks more about this option). I felt a bit more at ease when I could make his food and pronounce the ingredients. I use whole foods, a super duty blender, and I create a batch of green slime every two days (it takes me 2-3 hours). In addition, my child receives five “feeds” a day—over the course of one hour each. Do the math, I live in my kitchen. We also encourage oral skills, so we are providing several oral attempts each day. We encourage Chase to cook with us, prepare and taste his creations. He has a sweet tooth, anyone need any cupcakes? Apparently, I do, my hips are showing it! I have always enjoyed food preparation, meals with my family. But, like anything when you don’t get a day off, it is hard for the soul. I might add, I am a 100% single parent, so I am the only provider for meal prep, tube feeds, etc. So, here are some tips on how I made tube feeding great! Chase today at 3 1/2. 1. 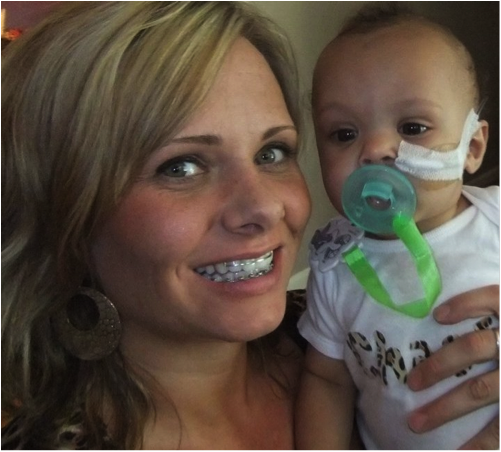 Forget the fact that you are inadequate or giving up on “oral feeds,” because your child must utilize a feeding tube. It IS saving their life! Whatever the reason, roll with it for now. Once things start to improve, make adjustments—more on that later. 2. Silly as it sounds, I make my kitchen a place I want to go. It is quaint, pretty and I always have my scented wax brewing! 3. I prepare/blend his food alone. I have the kids quietly occupied, so I can use it as time to refocus and most importantly, measure my ingredients correctly. I have been distracted, yep—that was the day I forgot to put the lid on the blender. 4. The psychological impact of not being able to bottle feed or breast feed my child was huge. It was a strange feeling, a mother is supposed to feed her child—it is natural. I felt very “empty,” especially he was a small infant. I honestly think I still grieve this. It was really hard for me to have a machine feed by baby, beep! beep! add more food—it felt so wrong. This was never addressed by any of our providers. And, if I spoke up, I was to be judged, so I kept quiet. I had to find ways to engage him, nurture him, without feeding. So, I made sure to spend ample amount of time snuggling. When he was younger, we did tons of “skin to skin” time, and still do. Of course this is important with any child. But, for tubie parents, even more so. 5. Chase participates in his tube feeding experience, always. He uses a small syringe to taste his blend while I am feeding him. He pops open his tube and attaches the extension. We talk about the food, smell it, and I point out the ingredients. I let him lick it, touch it, and help push the food through. 6. When doing #5, focus, be calm, have fun! There are days when I am in a hurry, or days when he is acting up, and it can’t impact the feeding. If he is crying, I can’t feed him because his stomach must be relaxed. 7. Personally, I provide my child with privacy. Yes, this is the way he eats and should be accepted by all. If we are away from home, we feed in the car. We don’t buy tube gear, colorful patches, or carve a tubie pumpkin on Halloween, etc. How he eats is only a small part of who he is. I am not going to draw attention to or identify my child by his small inability. 8. So, regardless of providing your child with privacy. There are days when you will have to explain your situation. It was much more often with the visual NG Tube (through the nose). Now with a Gtube (in the tummy), it is rare we will get asked about his feeding. I encourage you to use the best advice I ever got—explain your child’s “need” in 25 words or less. I don’t have to give a stranger (or even extended family) a “run down” of his diagnosis. I can simply say, “it helps him eat.” I found in the beginning, I was giving the “Cliff Notes” version of his health history to anyone who inquired. Now, he clearly hears me, and I respect his privacy. 9. Even though Chase is just starting to explore food, he loves to cook, stir ingredients, and taste his final product. I have him around food—ALL THE TIME! We have food within his reach from sun-up to sun-down. Even if he is licking on a cracker or smelling muffins in the oven, it is a food experience. 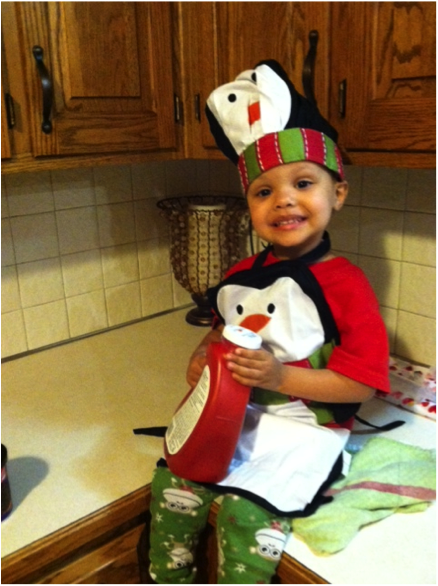 We have a play kitchen, we take our stuffed animals to dinner, we play with food frequently! Personally, I let him try anything—nutritional value (of oral food) is not a priority at this point. Chase never had baby food and rarely drank from a bottle because he had many swallowing issues. Now things are improving, the mechanical function of chewing is emerging, and swallowing is going great! 10. Sitting down at mealtime, with a child who can’t participate, was hard. For awhile, I tube fed him, then I ate with my other child. I could only focus on the inconvenience; it changed the dynamic of our family dinner. Stop! What was I thinking? Now, we have chosen to make family meal time a priority! Regardless, your child is getting the modeling experience of seeing other people eat and social interaction. Sometimes, his favorite part is giving the dog dinner scraps—heck! It’s modeling, the dog is eating…right? The best advice I can give for families who use a tube-feeding regimen is to never go backwards. Most children, regardless of diagnosis, can always improve the regimen that they are on and make it family friendly. And, all families can include their child in the mealtime routine, whatever that may look like. Eating is social in our culture. Allow your child to partake in this activity, it is about INclusion, not EXclusion! Chase was on 24-hour feeds, shortly over two years ago, with a feeding pump. Today he gets three feeds (during the day), two water boluses (with syringe), and we just started a small wean, which allows him to feel more hungry, by reducing the amount he gets. He will be off the feeding tube; I have no doubt. I encourage families to think outside the box and research options on various feeding protocols. Incorporate tube feeding into your world, don’t allow it to BE your world! Stacey Anderson is a thirty-something mom of a chubby Chihuahua, Olive, and two boys—Trent Nathaniel (13) and Chase Allen (3). 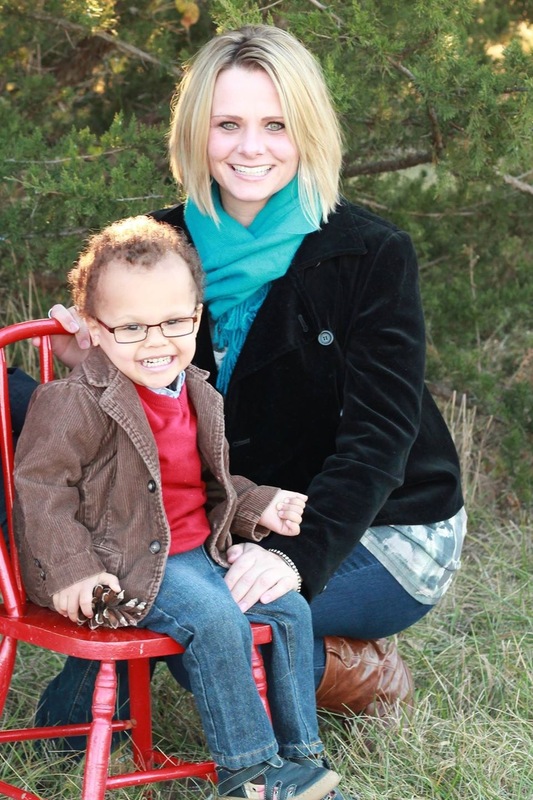 Embracing life as a solo parent, life took an unexpected turn in 2010 when Chase was born with Special Needs. Besides having a fondness for small coffee shops and thrift stores, Stacey adores writing. She shares her journey and new-found strength through online articles, her blog Solo with Stacey, and Disability Advocacy for the state of Missouri.